Professor Lee's main research interests lie in the study of strongly correlated electronic systems. These are materials where the interactions between electrons play a crucial role and lead to novel phenomena not explainable by single electron band structure effects. Examples include the quantum Hall effect, mesoscopic systems, and effects due to disorder. More recently, Professor Lee's research is focused on the problem of high temperature superconductivity. The starting point of this work is that the new family of superconductors is an example of the doped Mott insulator. The parent material is an antiferromagnetic insulator that is insulating due to correlation effects. Doping introduces carriers into the insulator, leading to a rich variety of novel phenomena including superconductivity. Methods of attack include many-body field theory and numerical work. 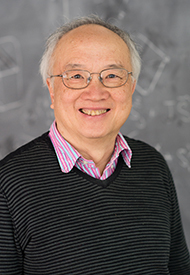 Professor Lee joined the MIT Department of Physics in 1982 after approximately ten years with the Theoretical Physics Department at Bell Laboratories. He has made key contributions to the theory of disordered electronic systems and is a pioneer in "mesoscopic physics," the study of small devices at low temperatures. Professor Lee introduced the concept of universal conductance fluctuations to describe such devices. For this, and other contributions to condensed matter physics, he was awarded the 2005 Dirac Medal of the International Centre for Theoretical Physics and the Oliver Buckley Prize of the American Physical Society. Professor Lee's current research interests focus on high temperature superconductors.